SAP® Ariba® delivers variety of solution in the areas of Supplier Management, Strategic Sourcing, Direct Spend, Supply Chain, Procurement, Financial Supply Chain etc. Each solution has discrete integration strategies. For e.g., Ariba Network can be integration with cXML, EDI, File etc where as Ariba Buying can be integration with Webservices, File etc. If a customer has both the solutions and he has to follow two different approaches to integrate his ERP with the respective system. This mode of distinct integrations will change in the near future and Ariba Cloud Integration Gateway(CIG) will be the single point of contact for all Ariba cloud solutions. What is Cloud Integration Gateway? 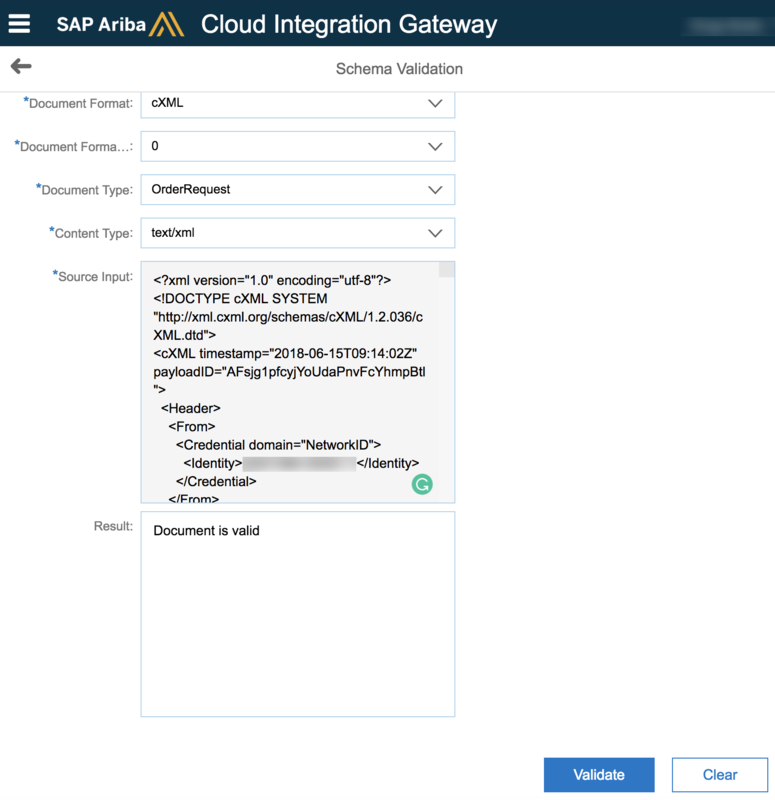 SAP Ariba Cloud Integration Gateway(CIG) enabled by SAP Cloud Platform Integration(CPI) is an offering that integrates SAP Ariba solutions into existing customer infrastructure. 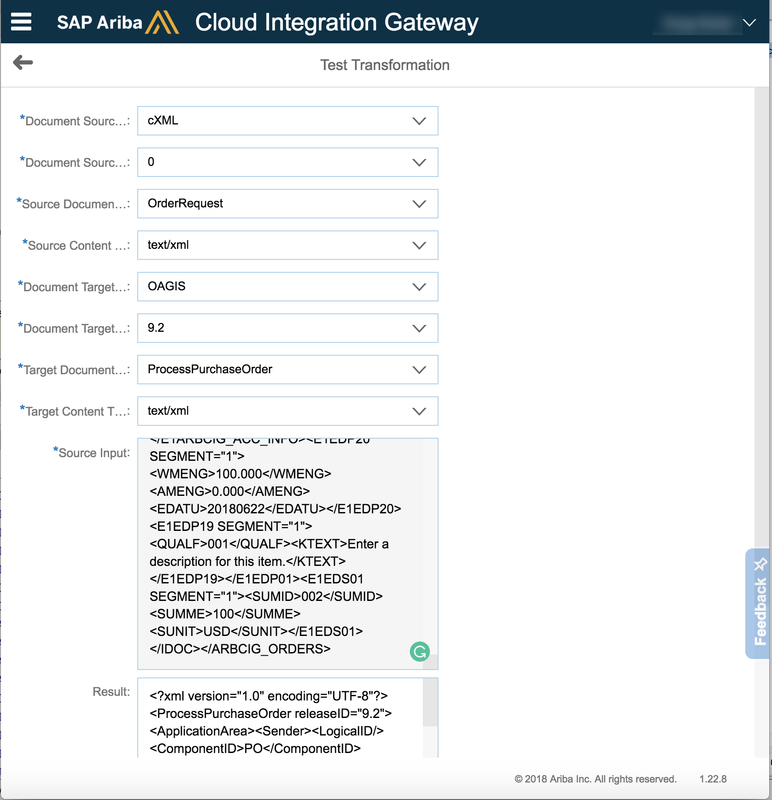 While SAP Cloud Platform Integration is a generic integration platform, SAP Ariba Cloud Integration Gateway specializes in supply chain and procurement processes with a defined set of message types and Ariba interface specific mappings. SAP Ariba Cloud Integration Gateway(CIG) accelerates the integration process by making it simple to connect trading partners, SAP Ariba cloud solutions like Ariba Network, Ariba Sourcing, Ariba Buying, Ariba Contract Management etc. and customer back-end systems like SAP ERP or SAP S/4HANA.Intuitive self-service tools let you quickly configure, extend, and test processes, while automated upgrades and monitoring make it easy to keep transactions flowing smoothly. CIG provides an efficient way to integrate buyer and supplier systems through one gateway to Ariba Network and Ariba solutions in the cloud. Also, Buyers can leverage the use of their existing integration solutions like SAP Process Integration(PI), Process Orchestration(PO) or Cloud Platform Integration. CIG also enables suppliers to connect once to Ariba Network to integrate with many customers without having to deal with buyer-specific mappings or customized configurations. Once CIG is enabled in AN buyer account, it will be navigated to a new URL https://integration.ariba.comcalled integration portal. It consists of various sections like Integration Projects, Tools and Transaction Tracker. Customers are required to create project – a wizard based integration configuration running based on the synchronized data when CIG is enabled in Ariba solution and in SAP ERP/S4HANA. In this project, various configurations like Basic Information, Connection,Mapping, Cross-referencemust be performed. 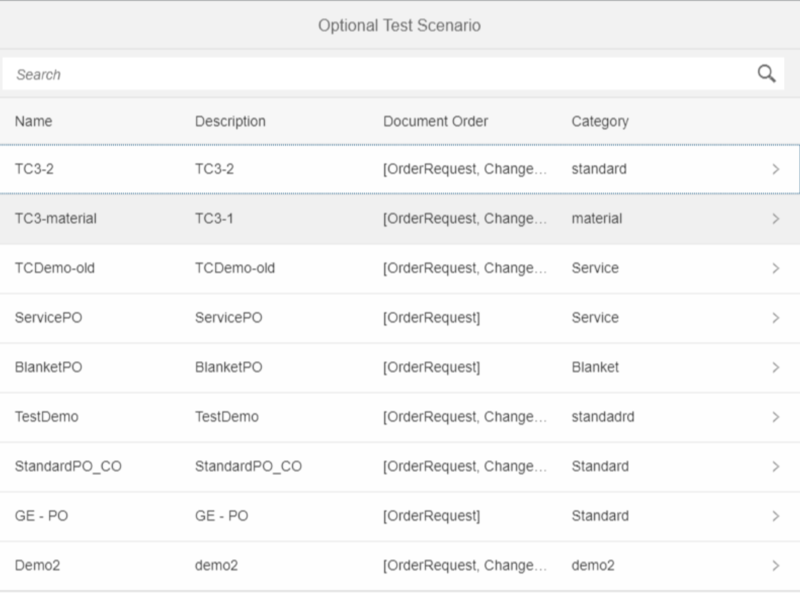 Tools like Schema Validation, Test Transformation, Test Connectivity are available in Integration portal. Schema Validationtool is to validate the data against B2B standards like UN-EDIFACT, ASC-X12, OAGIS, xCBL, PIDX, GUSI, EANCOM. Test Transformation tool is to perform the data transformation from the list of provided B2B standards to other format. For e.g., transform the cXML OrderRequest message to OASIS format. Test Connectivity helps the customer to test the inbound and outbound connections. Transaction Tracker enables the customer to monitor the inbound and outbound messages towards CIG. Buyers can track the messages based on their Environment Test/Production, Status or Type of the documents or Transaction Numbers. It has the repository of standard test cases available for the customer testing. Test cases can also be extended as per the customer requirements. It also simulates the response from Ariba supplier. Thanks for sharing the nice information about CIG. I have a question. Please note I am not a technical person. We are using CIG to connect TIBCO. But TIBCO is expecting a value in SOAPAction property in the WSDL. But we were told Ariba CIG do not send any value in SOAPAction property and this is standard. Is there any way that we can pass value in SOAPAction property to TIBCO? Appreciate your inputs in this regards. Good blog. One doubt. 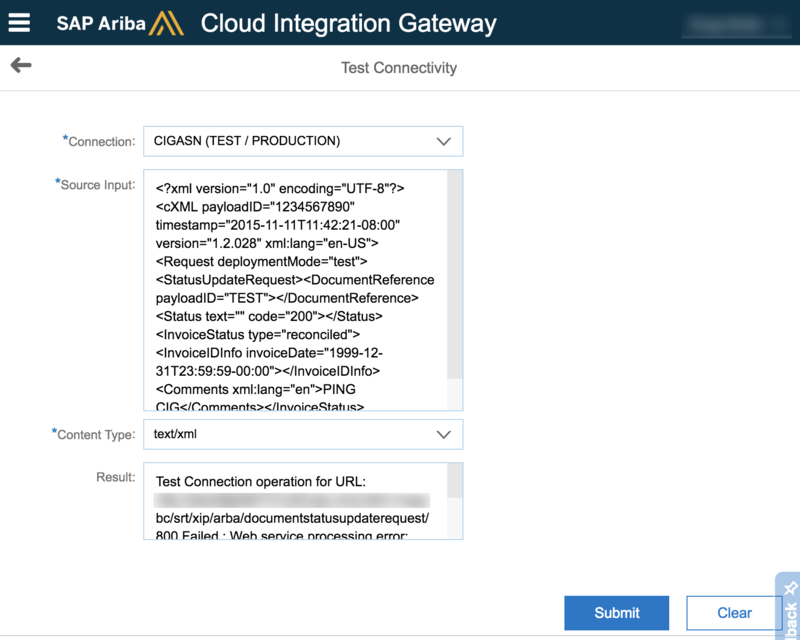 If a customer is already implemented a custom HCI/CPI solution (RFQ- Sourcing Request integration ) and now want to migrate to CIG, Will the CIG enablement (https://integration.ariba.com) will re-direct them to the same CPI instance or it will be a different system itself in the cloud? CIG is altogether a different solution and will not be redirected to the same instance. However, customer can leverage the use of CPI and still route the message to CPI instance but as a pass-through. All the transformation will be performed in CIG. Thanks for sharing such a brief document regarding CIG. I started implemented CIG and successfully integrated transnational data integration SAP ERP 617 with CIG and getting an error ‘java.lang.Exception: java.lang.IllegalArgumentException: idOrPartnerId is empty@ line 148 in extractXMLVariables.groovy’ while replicating Quote request to Ariba Sourcing. Implemented customer exit for RFQ also and getting confused to find Variant and partition name. Could you please help me to overcome from this error. Hi Ashish, It seems some issue with data synchronisation between CIG and Ariba. Could you contact CIG support? otherwise, try disable and enable Cloud Integration Gateway again. Tried by doing disable and enable CIG but still issue is same. I raised SR regarding the same. Ashish Gupta – is your CIG error issue resolved for RFQ integration ?? can you share a resolution if it is resolved ? Still issue in debugging phage, Once it will solved i’ll update you. Check with Basis team for the Add-ons, This issue is related to installation of Add-ons in ERP system, which not properly installed. Did you find a way to get information on Variant and partition name? we are using our PI for connecting to CIG and for inbound connection should we open ports on our firewall so that CIG can connect? Please let me the know the options to configure the connectivity from CIG to on premises PI system. Sorry for the late reply. Yes, of course, if you would like to expose your PI system directly, you need to open ports. Opening HTTP port would be a security thread, that’s why the recommendation is SAP Cloud connector for Inbound traffic. Hope that clarifies you..
Is their any way to check log generated after executing “ARBCIG_MASTER_DATA_EXPORT” program in SAP regarding master data integration for Ariba sourcing as request completed shown by SAP ECC. Can see IDoc easily which generated, when i sent RFQ to Sourcing from T-Code “WE02“. Yes, you can check it in SLG1(Application Log) and SRT_MONI. But still if you want to check the logs at the communication level, you can record in SMICM (HTTP recording) and look into the logs. You can also check in CIG monitoring portal for further tracking. Do you ever encounter the problem where the web services /sap/bc/srt/xip/arba/ were missing after Addon Installation? I am having this problem and even after uninstalling completely and re-installing the latest version of the Addon, the web services are still missing. Hi Yacouba, can you check in this path /sap/bc/srt/xip/sap/?